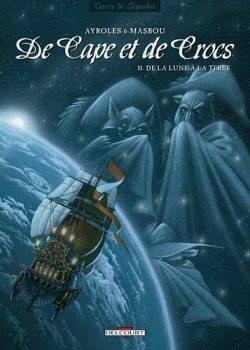 The French anthropomorphic bandes dessinees series De Cape et de Crocs (roughly With Capes and Fangs), featuring the exploits of a gentleman fox and wolf adventurers in 17th century Europe and on the Moon, has finally come to an end with Act 10, “De la Lune à la Terre” (“From the Moon to the Earth”), published by Delcourt on April 11, 2012. Prince Jean vanquished, the Moon saved, the hour has come for Gentlemen de Villalobos [the Spanish wolf] and Maupertuis [the French fox] to dream of returning. But the ignoble Mendoza has not said his last word, and with love, honor, and friendship still opposing each other, the comedy can still turn to tragedy. Before withdrawing their reverence, our gentlemen-heroes still have terrible coups de théâtre to deliver. Will they arrive safely? To dispel any doubts that you may have, you may be sure that the album conforms on all points to the desires of the authors: the blank page that follows page 48, between the last two pages of the comic book on the endpapers, corresponds to the wish of Alain Ayroles and Jean-Luc Masbou: to surprise the reader with one of those coups de théâtre to which they have the secret! 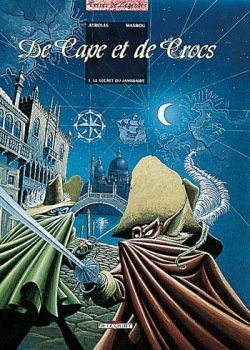 De Cape et de Crocs, by Alain Ayroles (writer) and Jean-Luc Masbou (artist), published by Delcourt in Paris in a series of 48- to 52-page hardcover albums approximately every 2 1/2 years, was launched with Act. 1, “The Janissary’s Secret”, on January 14, 1999. Act I. Aboard a Turkish ship, a strongbox. In the strongbox, a jewelry box. In the jewelry box, a bottle. In the bottle, a map, and on that map … the location of the fabulous treasure of the Tangerine Isles! There is no choice for two proud gentlemen, expert swordsmen, and boasters, but to throw themselves into an adventure that, from jails to galleys, will lead them to the ends of the world [and, as the reader finds out, beyond]. The series has its own website, on which many questions will be answered (in French) and many samples of the art are shown. The entire series is available on Amazon.fr.